C!SN 10.11.15: We have a surprise! Also, Weiland’s Market, The Bosco Center, Lisa Anglim of Sugardaddy’s Sumptuous Sweeties, and Continental Office Environments. Greetings C!SN listeners! This episode starts with Burke and me talking about the technical needs when creating a podcast. Specifically, our computer blew up this week and ~yipee~ a new computer was purchased this weekend! But, it is all a blessing and we are happy to continue on with this hobby turned lifestyle called Columbus! Something New! And I am in the market for a fine, used Chevette. Take a listen! Next, we talk about our surprise. I am not going to give it away here! Listen listen listen! 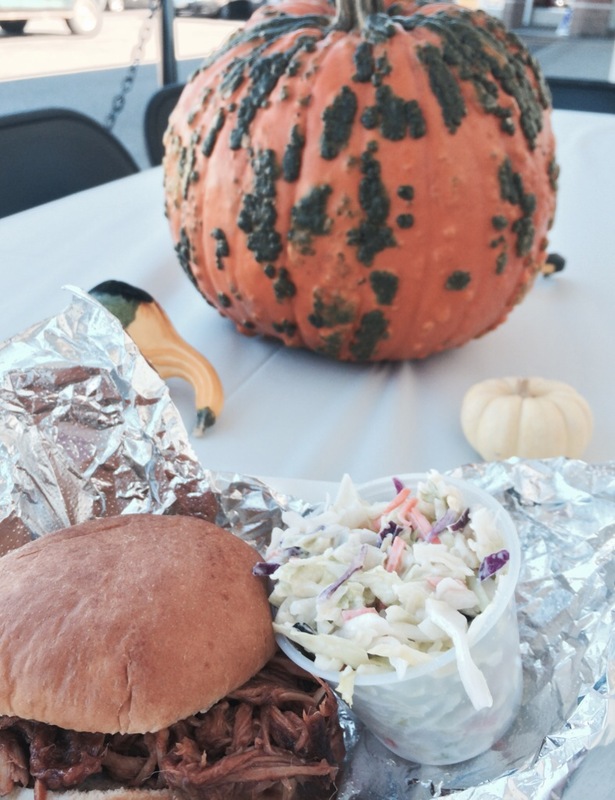 Saturday, Burke, Carrigan and I went to Weiland's Market for their Fall Cookout. Keep in mind, you can contact Weiland's Market for your catering needs. This cookout was a fantastic opportunity to taste their pulled pork and pulled chicken sandwiches, loaded potato salad, coleslaw (all this time, I thought it was 'cold slaw? '), cowboy baked beans, and corn pudding. See above photo for my tasty lunch! C!SN is happy to connect you to Weiland's Market as it has been a family owned market since 1961! Remember this spring Burke and I went to The Bosco Center for the Bosco Flea? We saw people going into the center and wondered what was going on inside the building. We ventured back Sunday and discovered the whirlwind of activities inside! We met Anna and her brother, Alex, and learned The Bosco Center has an eight-lane bowling alley along with a bar, a cafe, ballroom, a basketball court...I could go on and on! Check our their website and facebook page for all the activities they offer: free bowling, Brunch and Bowl, and more! Bizjournals.com recently featured two friends of C!SN: Tonya Eberhart with BrandFace and Lisa Anglim with Sugardaddy's Sumptuous Sweeties! Our interview with Tonya is available on our Archive page, while on this episode we reach into the C!SN vault and replay my interview with Lisa Anglim. Burke and I are inspired by Lisa's creativity in response to business obstacles she experiences! We admire her and are happy to feature this interview again on our podcast! Continental Office Environments contacted us regarding their current contest. Now, Continental Office Environments began in 1939 here in downtown Columbus! Talk about a company with its heritage right here in Columbus! That is Continental Office Environments! An interview is in the works, but in the meantime, take a look at their website and then click on their Inspired Contest. This is a movement to share that which inspires you. C!SN's entry is a photo my daughter, Carrigan, took at 400 W Rich the first week or so of C!SN's existence. Burke and I are inspired by this humble building which creative artists and crafts-people re-energized! While you are visiting the Continental Office Environments website, vote! I am aiming for 2nd place for a couple of reasons! First, if we were to win the first place chair, I would cover it with furniture plastic and not allow anyone to sit on it! It is beautiful! Ha! Second reason is my love for Ray Eames's Dot Pattern. The 2nd place Eames Hang-It-All reminds me of her beautiful pattern! See, it all makes sense! We wrap up the show with some thoughts; Burke chats about the Columbus Blue Jackets and OSU Football. I talk about the amazing art you will see if you follow scottish_cobra on Instagram! That's you, Devin!